Want to grow delicious, healthy fruit without chemical sprays, "organic" sprays, and other intensive management strategies? We'll examine the pest triangle, showing what brings on pest problems and strategies for avoiding or controlling them. Simplified fruit growing emphasizes a number of straightforward practices, including, depending on the plant, pruning, soil, site selection, and natural pest management. 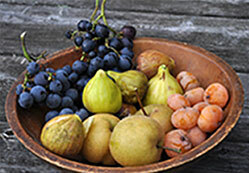 Plant selection is important, and the key ingredients to successful growing of pear, pawpaw, raspberry, and other easy-to-grow fruits will be highlighted. The result: Abundant fruit without having to resort to extreme efforts.